Reflections on the Fragility of State Institutions in Africa; A.A. Yusuf. Internal Conflicts in Africa. Is there a Right of Humanitarian Action; E. Kwakwa. United Nations Peace Keeping Role: the Angolan Experience; M. Sinjela. Le mécanisme de l’OAU pour la prévention, la gestion et le règlement des conflits; M. Djiena Wembou. 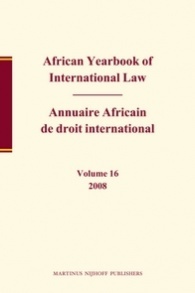 The African Debt Problem: Legal and Institutional Dimensions; F.X. Njenga. International Law and Sustainable Development: the Convention on Biological Diversity; A.A. Yusuf. L’Union du Maghreb arabe; A. El Kadiri. Indirect Effects of U.N.
Sanctions on Third States: The Role of Article 50 of the U.N. Charter; G.L. Burci. La contribution des Etats africains à la renaissance de la C.I.J. ; M. Mubiala. The U.N. and Internal Conflicts in Africa: A Documentary Survey; M. Sinjela, F. Ouguergouz, A.A. Yusuf. Fatsah Ouguergouz, La Charte africaine des droits de l’homme et des peuples; D. Turk. A. Adede, International Environmental Law; M. Politi. OAU: Resolutions and Declarations Adopted at the Thirtieth Session of the Assembly of Heads of State and Government.